This has 'Young Life' written all over it. 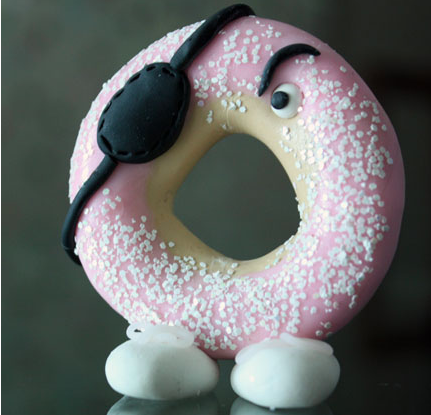 Wednesday, Sept 19th, is the International Talk Like A Pirate Day. In honor of the parodic holiday, Krispy Kreme is giving away free doughnuts. If you show up to a Krispy Kreme on Wednesday and talk like a pirate, you get a free doughnut. Ahoy Matey! There she blows! Yo Ho Ho! Shiver me timbers! 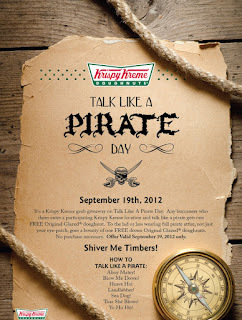 If you show up fully dressed like a pirate, you get a FREE DOZEN DOUGHNUTS. Sounds like I might be picking up a car full of high schoolers after school on Wednesday. Now I've just got to fill my trunk full of eye patches, bandanas, leather boots, and MC Hammer pants. For some reason Krispy Kreme isn't allowing real swords or pistols to be part of the costume. Here's some help on how to dress like a pirate. Here's all the details from Krispy Kreme.